We've just pushed Android Studio 2.0 Preview 3 to the canary channel. 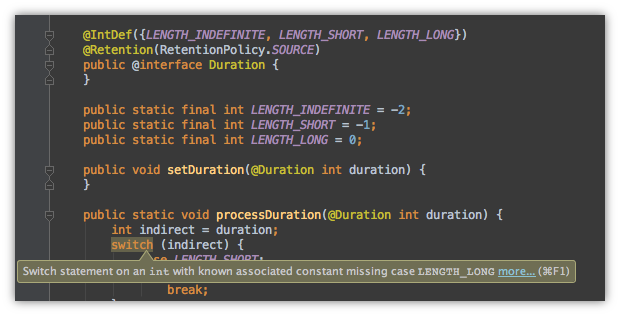 A new lint check which flags incorrect attempts to insert version numbers in Gradle file using String interpolation. This will automatically flag this "gotcha"
Two new security lint checks contributed by Michael Peck: One which looks for native code in unsafe locations (such as asset folders), and another which flags Runtime.load() and System.load() calls. The translation editor now supports speed search (and F2 to enter cell editing). We've also tweaked the Instant Run facility such that when changes can't be hotswapped, there's a confirmation dialog before restarting the app. We'll be tweaking this in the next preview build. You can update your current 2.0 Preview installation to Preview 3 via the built-in patch mechanism (Check for Updates). You can also update from 1.5 to 2.0 Preview e via the patch mechanism, but you may not want to do that: See our page about how to keep multiple installations simultaneously while Studio is in preview mode. You can also download a full zip of 2.0 Preview e from the Android Studio 2.0 Preview 3 page.